Uzoma Nwazuoke is the Chief Executive Officer of the Victory Empowerment Centre, a microlending institution that enables women to access small loans towards eradicating poverty. 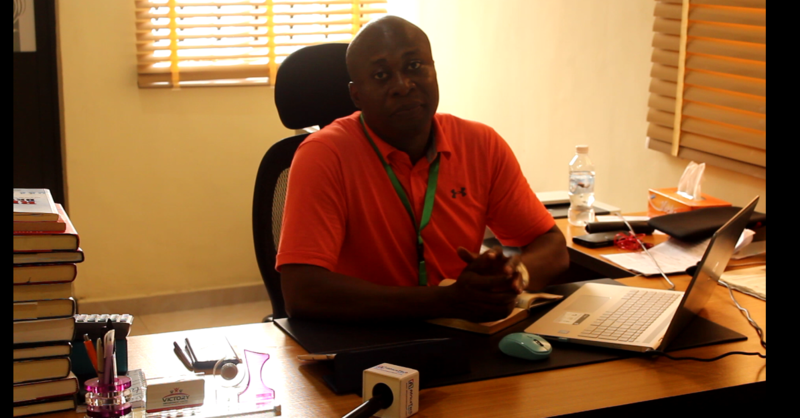 AfricaTechReport: How did Victory Empowerment Centre start? Uzoma Nwazuoke: I started Victory Empowerment Centre in 2013 at Ikotun, here in Lagos. Before we launched I was working with Zenith Bank Plc, it was while I was with there that some people from Bangladesh came into Nigeria. By the way, Bangladeshi people have one of the best micro-finance structure in the world. When they came, they came with Grooming Micro-finance bank, the institution was also working with Zenith Bank, so I was asked to join the team. I worked on that team from where I understood what running a microfinance bank looks like. In conjunction with my wife, we went and registered an NGO, did all necessary certifications and started. However, I soon discover that after each month, I ended up using my pay at the bank to pay the staffs, such that I don’t have more than 20,000 naira after. I encouraged myself and went to met a friend, who borrowed one million naira. It was with the help of that loan that things began to fall into place. AfricaTechReport: Who are your target audience? Uzoma Nwazuoke: We focus on women at the bottom of the pyramid and that’s what microfinance institutions ought to do. So we give loans to people like the pepper sellers at the market, who do not have what it takes to go to a full-fledged bank for loans. We started giving out loans of 10,000 and more. Today, we can boldly say we have lifted a lot of people out of poverty. We started the journey in Ikotun, but we now have twenty branches in two states, with plans to do more. AfricaTechReport: How has the social media platforms enhanced your access to those at the bottom of the pyramid? Uzoma Nwazuoke: Ordinarily, most of these women don’t use social media platforms, in fact, some of them do not even have phones. All the same, we have Facebook, Twitter, Instagram and LinkedIn handle where we make constant post weekly. Our target for the platforms is to get across to the elites because we need investors so we can do more towards eradicating poverty from Nigeria. AfricaTechReport: Tell us how you intend to deploy tech towards maximizing your business efforts in the future? Uzoma Nwazuoke: At the moment, our workers go about the collections with books because we do weekly collections from all our customers. Our plan is to procure tablets for all our workers with internet subscription on the tablets so that they can record real-time transactions on the field before getting to the office. With this in place, we can always monitor activities from the office before they come back as obtained now. AfricaTechReport: What are the risks you are facing? Uzoma Nwazuoke: We do not really have cases of customers absconding with our money, although when the sales at a particular period are low, there may be default, but they usually payback. AfricaTechReport: So the women do not abscond with your money? Uzoma Nwazuoke: No, we do all necessary checks before giving you money. For instance, we don’t give individual loans, rather we give only groups loans of five to thirty persons in each group. Before the loan is disbursed, we will go to where you are selling and check whether you truly own the space, we won’t stop there because anyone can make the false claim with location. We proceed to check where you stay and ask around the place if people can vouch that you stay there after which the rest members of the group are made to take responsibility for you. AfricaTechReport: what if one of the women still absconds? Uzoma Nwazuoke: Well, the other members of the group will be made to pay for the fellow. There are cases where some members default, but the leader or secretary of the group rallies others to help the defaulting member, who in turn pays them back. Again, when we started we were simply giving the women cheques, which they go to catch, but now we have mandated it that all our clients must have account numbers. Once the loan is granted we simply transfer to your accounts. AfricaTechReport: Do you think the government is doing enough in supporting the microfinancing institutions and what do you think they can do more? Uzoma Nwazuoke: The government is not doing enough, the statistics they released one time states that the microfinancing institutions are expected to cater for over seven million people, but we know they are more than that. Yet only last year or two years ago, Lapo which is like one of the major microlending institutions just celebrated a million customer base. The government should give us money at loan interest rates. Locate those who have achieved the result and give them the necessary financial support to reach more people not things like TraderMoni and MarketmONI. I am sure you are aware many people are already saying both schemes are pure vote buying, the people who are beneficiaries of these schemes do not use them for business because they are not expected to pay back. so some can simply divert it to As0-ebi, Owanbe or any other trivial thing aside their business.